Home > Resources > Transfer > How to Copy Contacts from iPhone to Sony Xperia? You have got a new Sony Xperia Z5 as birthday gift and it is a pleasant thing to give away your old iPhone that you have used for a long time. However, how about the contacts that still on your old iPhone? I think no one is willing to type the contacts in the new mobile phone one by one manually, which is an extremely time consuming and boring task, not to mention those who have hundreds of names and numbers need to type. Fortunately, now we have third-party iPhone contacts to Sony Xperia transfer tool - Coolmuster Mobile Transfer, which can perform an one-click way to copy all contacts on your old iPhone to Sony Xperia Z5 with comprehensive contact info kept, including phone numbers, job titles, company names, email address, etc. Apart from contacts, you can also share SMS, photos, videos, music and even apps between iPhone X/8/8 Plus/7/7 Plus/6S/6S Plus/6/6 Plus/5S/5 and Sony Xperia Z5/Z4/Z3/Z2. It is fully compatible with all mobile devices run Android and iOS systems. You will find that doing it is so simple because with the help of Mobile Transfer, the whole transfer process can be fast, safe and convenient. The following part is the easy steps on how to copy contacts from iPhone to Sony Xperia. 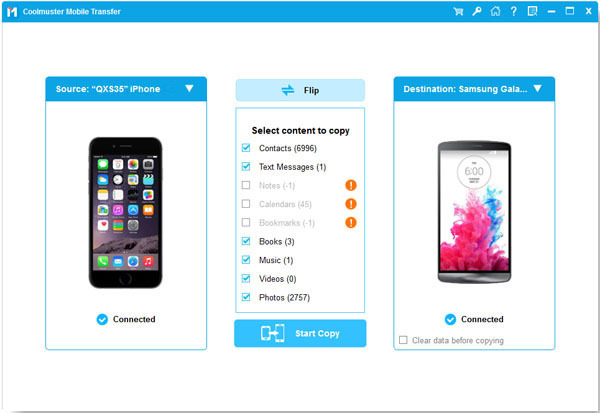 For the first step, you should download and install the Mobile Transfer on your computer. After that, launch it and you will see the primary window. Use two USB cables to connect both your iPhone and Sony Xperia to your computer at the same time. The software will detect and show them in the program window. You can also see all transferable file types are listed on the above. As I mentioned above, this tool can transfer not only contacts, but also many other files. Therefore, you should tick off the file types you want to transfer, such as "Contacts" and then click "Start Copy" button to start the transferring process. There will be a progress bar popping up to tell you the transferring situation. The whole transfer can be completed soon.